Unwind at the adult-only pool at The Cloister. 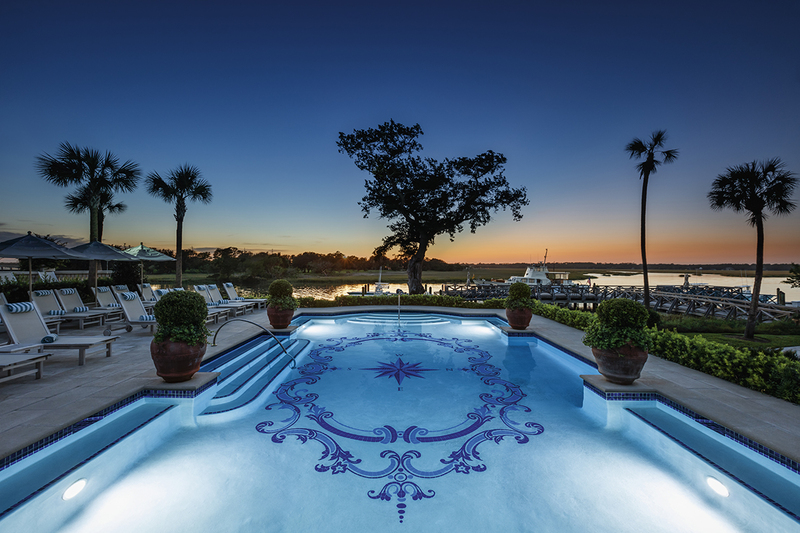 From fun family venues to peaceful retreats, the pool experiences at Sea Island offer something for everyone. If your idea of the perfect pool day looks more Zen than zany, there’s a pool for you at Sea Island. Or, if your favorite vacation photo features choreographed, midair jumps into a pool filled with splashing kids while teens are Instagramming their many trips down the 20-foot waterslide nearby, there’s a pool for you, too. With seven pools dotting the property, and another 5 pristine miles of private Georgia coastline to explore, members and guests at Sea Island will not have any trouble finding the ideal way to soak up the sun near the water. Whether it’s a shady lounge chair at the adult pool with nothing but the sound of sea gulls overhead, or a trip to the family pool, where the day’s soundtrack will be filled with merriment, there are plenty of poolside adventures to be had. Each swimming area has its own personality, guaranteeing an experience to match your mood and expectations. No matter where you choose to plant yourself, you’ll find piles of fluffy beach towels, poolside dining options and plenty of umbrellas to keep your drinks cool. The Beach Club is the perfect place to gather with the family, offering multiple pool experiences complete with a splash pad and a slide. At the family pool, a 115,000-gallon zero-entry pool located in the heart of the Beach Club near the Atlantic ocean, newer swimmers and their watchful parents will love the warm water and adjoining splash pad. The big pool is heated to a comfortable 82 degrees so kids can stay active for hours. The Beach Club also boasts an expansive lawn, perfect for sunbathing and children’s activities, with a sandbox and accompanying playground. Just a hop, skip and a jump away at the Beach Club is the bridge pool, a 105,000-gallon free-form pool with a curving, waterpark-style slide that winds 20 feet before releasing participants into the water. Even the hardest-to-please kids of all ages will break out in a wide smile after a few trips down the enclosed slide. Another notable feature of this pool is the bridge from which it gets its name, offering sprawling views of the pool area and the ocean beyond. The inviting hot tub on the pool deck is another option, easy to climb in and out of, with plenty of bench room for serious soaking. After working up an appetite, swimmers can order off the menu at the Snack Shack, enjoying burgers and sandwiches on a terrace overlooking the pool, or delivered poolside to the family basecamp. Those looking to enjoy a sweet treat can also visit Wonderland, a magical spot offering milkshakes, sundaes and more than 20 different types of hand-dipped ice cream. It also serves fresh-brewed coffee, should mom and dad need a pick-me-up. The new pool at The Lodge opened at the end of 2018. If your pile of beach-reads tends to tower, the adult-only pool, also located at the Beach Club, is the perfect landing place for a quiet day of uninterrupted reading. The unparalleled level of service and amenities will enhance the already memorable and relaxing experience. Gorgeous locker rooms are located near this special pool as well, complete with a steam room and showers. For couples or small groups who prefer the ultimate in luxury and convenience, air-conditioned cabanas are located on the adult deck, and can be reserved on a daily basis. These oases include fully stocked refrigerators, 55-inch flat-screen televisions, beautifully furnished sitting areas and private bathrooms. Reservations can be made through the on-site concierge, who will help design a customized day that you’ll want to write home about. Here, hourly amenities, complimentary sunscreen and magazines are simply a small part of the magic. Elsewhere at Sea Island, other swimming areas offer additional places to relax. At The Cloister, the smaller adult pool will align with members and guests who prefer a laid-back experience; the setting is beautiful, with the pool overlooking the Black Banks River. Similarly, The Lodge, which is situated among Sea Island’s championship golf courses and just a few minutes’ drive from The Cloister, also has a quieter pool scene. This new swimming area just opened at the end of last year, offering breathtaking views of the ocean and St. Simons Island’s stunning sunsets. Spagoers will find even more peaceful pool settings. In addition to a relaxing garden atrium, a eucalyptus-infused steam room and a dry sauna, The Spa at Sea Island has plenty of water in which to unwind. Both the men’s and women’s locker rooms contain serene soaking tubs where visitors can enjoy mineral baths. There is also a water atrium that offers a hydrotherapy pool, and the Fitness Center includes a heated indoor lap pool. Because these spaces feature age restrictions, adults can enjoy a deeper level of rest and relaxation. 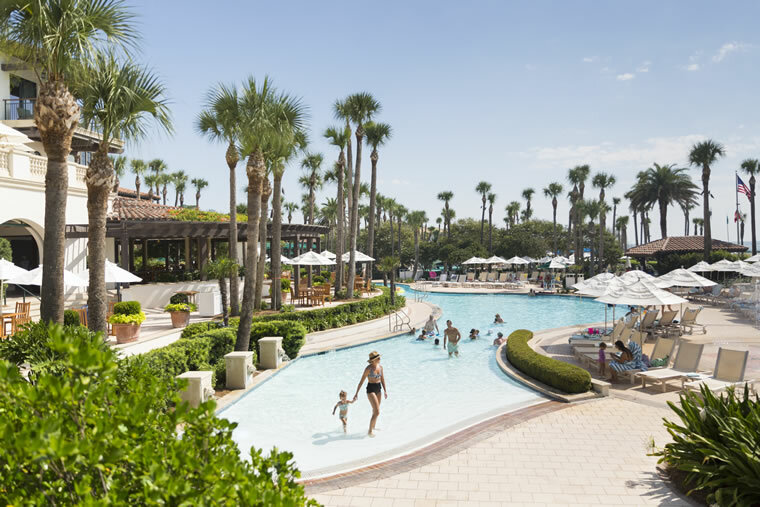 With playful places for kids to splash and serene oases offering endless tranquility, spending the day poolside at Sea Island is sure to be one of the highlights of your visit.